With summer sea ice extent decreasing in recent years in the Arctic, the polar bear, whose natural habitat is the sea ice, has been receiving increasing attention in other parts of the world due to concerns over its ability to adapt and survive under the changing conditions. Currently listed under Appendix II of the Convention on the International Trade in Endangered Species of Wild Fauna and Flora (CITES) (a multilateral treaty that protects some 34,000 plant and animal species to varying degrees depending on the level of threat they face to ensure the trade of these species does not threaten their survival in the wild), there is debate over whether or not to up-list the animal from Appendix II under CITES to a more protected status under Appendix I. Animals and plants listed under Appendix II are “not necessarily threatened with extinction" yet "trade must be controlled in order to avoid utilization incompatible with their survival." Those listed under Appendix I are said to be “threatened with extinction” with trade of specimens “only permitted in exceptional circumstances." The five Arctic coastal nations currently have differing opinions as to whether or not the polar bear should be up-listed to Appendix I. The United Sates, with the support of Russia, has proposed that the species be up-listed. Canada, Denmark, and Norway say that current protection measures are more than adequate. Markus Dyck, a polar bear biologist and Arctic resident working for the Government of Nunavut, gives his perpsective on the situation of polar bear populations in the Arcic. According to Environment Canada, there are an estimated 20,000 too 25,000 polar bears in the Arctic. How are their numbers monitored and how accurate are current estimates? In Canada, the provinces and territories are responsible for managing polar bears. There are 13 polar bear subpopulations in Canada, some of which are co-managed with the US or with Greenland; of the 13 populations within Canada, 12 subpopulations are in or are shared with Nunavut. Therefore, Nunavut has the largest responsibility to manage and monitor polar bear populations in the country. Each jurisdiction determines its own monitoring and inventory cycle, but there is a lot of cooperation and collaboration amongst jurisdictions that share populations. For jurisdictions that only have one population (Manitoba, Ontario, Québec), monitoring is slightly easier from a logistical and financial point of view. In Nunavut, the logistics of conducting polar bear research are much more challenging given the vastness of the terrain and the environmental variables. Despite all that, the Government of Nunavut is spending on average about 1 million dollars per year on polar bear research and population monitoring. In many cases, polar bear work requires a network of collaborations in order to be successful and to obtain adequate data. One way to monitor populations is through a capture-mark-recapture (CMR) study where abundance estimates and vital rates (survival, recruitment, etc.) are determined, enabling the estimation of a population trend via the population growth rate. If CMR studies are employed, monitoring in general occurs every 10-15 years in Nunavut. However, whenever there are concerns brought forward by hunters and local people about a population and its bears, the government responds quickly and conducts new studies in order to be able to make the best management decisions using the best available science and traditional knowledge. The Government of Nunavut, in response to Inuit concerns about the handling of wildlife, is constantly working to employ innovative alternatives to the traditional CMR. The rate at which monitoring occurs also depends in part on the technique that is used. Aerial surveys do not provide the same information a CMR study does, so in order to establish a trend of abundance, several aerial surveys are needed at set time intervals. We cannot forget, however, that polar bear research is a relatively young endeavour – the first studies began in the 1970s, and only more recently have well-designed studies been conducted that avoid possible biases. Science has evolved, and techniques have improved considerably, so the accuracy of studies has also improved over the years. In Canada, we probably know a fair deal about our populations. But there are a few of the 19 world subpopulations were data are still sparse, and research remains a challenge, from a logistical and financial point of view. About 15,500 polar bears live in Canadian territory, according to Environment Canada, or about 2/3 of the total species population. Why are they concentrated in the Canadian Arctic? Is it due in part to the fact that the thickest sea ice and thus the sea ice most resistant to summer melt tends to be in the region north of the Canadian Archipelago? Polar bears are a circumpolar species that require sea ice for various life history events and feeding. In general, wherever there is sea ice, either seasonal or annual, polar bears can be found. Their distribution depends mainly on the distribution of seals and the productivity of the area they inhabit, but is also affected by sea ice movements. There are several polar bear subpopulations that are forced ashore during the summer months, such as the bears of the Hudson Bay complex, and the Davis Strait and Baffin Bay areas. These bears come ashore whenever the sea ice retreats and melts – they conserve energy throughout the summer and remain in a lethargic state with a reduced metabolism. In thick and closed sea ice it is hard for seals to maintain breathing holes; consequently, there will not be too many bears in the area. Seals, and the bears that prey upon them, are typically found near cracks or leads, floe edges, ice floes, polynyas, and consolidated chunks of ice and pressure ridges. What stressors do polar bears currently face? Polar bears are faced with various stressors: contamination, climatic changes, resource development and exploration, increased shipping through the Arctic, and harvest. Many jurisdictions have been regulating harvest levels very well; while illegal hunting may be a problem in certain areas, to my knowledge it is not an issue in Canada. 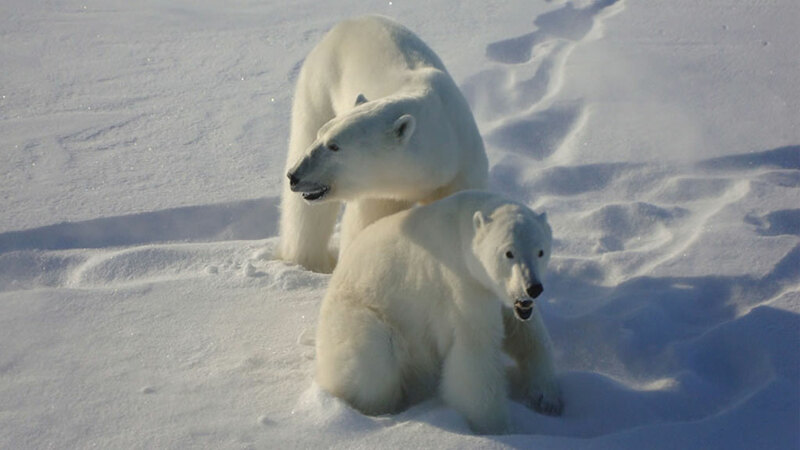 A great variety of pollutants can be found in polar bears and there are national and international monitoring programs in place that we participate in. Our samples contribute to establishing baseline data on these contaminants. For many of these chemical compounds, the long-term effects on polar bears are not well understood; although, some seem to suppress the immune system of polar bears and may have an effect on reproduction/reproductive organs. Almost all of these pollutants originate in the south, and are carried through water and air currents to the Arctic. Polar bears are apex predators, and their contaminant load is determined by way of bioaccumulation and biomagnification. Contaminants are always a concern because people in Nunavut consume polar bear meat. Resource exploration and development create a dichotomy between economic growth and independence, and exposing the environment to threats caused by those activities. For example, increased shipping traffic with ice-breakers can change ice floe size, which in turn can affect important feeding and breeding habitats of polar bears and seals. In general, these activities are required to go through extensive review processes; however, once approved, and in case of any accidents, effects on the environment could be detrimental. Through our polar bear work we attempt to collect as much data as we can in order to be prepared when faced with assessing environmental risks due to development. 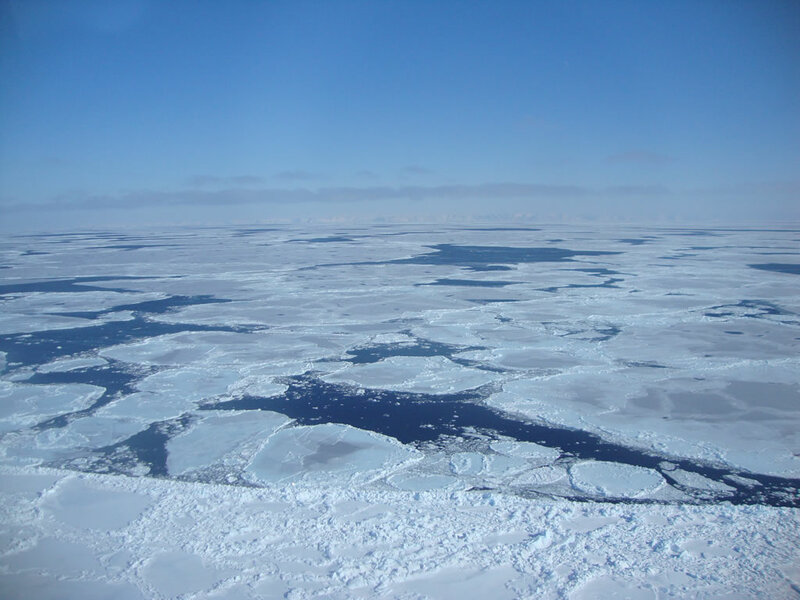 Besides the potential for an increased demand for resource exploration/development in the Arctic, a higher frequency of ship traffic passing through the Northwest Passage can be expected with a decline of sea ice. How governments are able to respond to oil spills in the Arctic in case of a disaster has been a concern of mine for quite some time. What has the general trend in the polar bear population size been since the scientific and international community started to be concerned about overhunting of the species in the 1960s and 1970s, and in particular since the five Arctic coastal nations signed the 1973 International Agreement on the Conservation of Polar Bears? What is known with a degree of certainty is that polar bears were historically harvested at high levels (Norway, Russia), and some populations were thought to be in danger of becoming extirpated if harvesting was not curtailed. That is the reason why the Agreement came into force. The world abundance at that time (1960s) is unknown, but numbers likely ranged from 8,000-15,000. There is also a very high degree of consensus among biologists and Inuit that the numbers of polar bears are now the highest in recent recorded history – a sign that polar bear conservation has been successful and is working effectively. The world trend of polar bear abundance has been pretty stable over the past 10-15 years, although it should be noted that some individual subpopulations have experienced slight declines, while others have experienced increases. Has there been a notable decline in polar bear population since Arctic sea ice has started disappearing dramatically over the past decade or so? There are several populations where declines in body condition and survival rates have been recorded and linked to sea ice changes; however, there are only 1 or 2 populations that appear to be declining slightly (but significantly) due to changes in sea ice. Unfortunately, the populations where a decline has been reported are also populations where there may be some issues with the sampling methodology – although that is rarely mentioned in the media. One factor that also needs to be explained at this point is that currently polar bear populations are at their highest numbers. There is a very high degree of uncertainty surrounding the abundance of seals in many areas, as well. What is being attributed to climate change could also to some degree be caused by competition for food, or it could be acting in an additive fashion. There are still quite a few things that biologists need to learn and understand about polar bears: ecosystems and climate are complex. Climatic changes are real and observed. However whenever cyclic and annual variability in sea ice extent, distance of the sun to the Earth, food availability and competition gets thrown in, the whole scenario becomes a puzzle that requires attention to details and how the parts interact. That is the difficult part. Overall, Nunavut polar bear abundance has remained quite stable over the past 10-15 years. That is not to say that there will be no changes in future abundance; however, if changes become apparent, our adaptive management system is flexible enough to provide adequate management adjustments. There have been reports of increased sightings of polar bears on land in recent years, which many attribute to the decline of polar bears' natural habitat, the sea ice. Is this an increasing trend and is it significant enough to warrant concern? It is always important to be specific: where are these reports coming from? Who reports them? Where do these sightings occur? If the reports come from Churchill (Manitoba), then one has to be cautious because at times it depends on how concentrated efforts are by wildlife officers to catch bears that come close to the community. In general terms, the distribution of bears on land is also determined by where sea ice stays the longest and where it disappears the earliest. That is driven in part by water currents and winds; there are also annual variations. In Nunavut we have years where there are areas with later freeze up, or sea ice breaks up differently, and hence bear distribution and abundance locally during summer and fall on land also varies. We also know from local knowledge that 30 years ago Inuit could go on the land and camp or fish, pick berries and collect eggs for weeks without seeing any polar bears. Nowadays, in many areas where sea ice is seasonal and bears are forced to shore, locals have to be vigilant because there are more bears than in the old days. This obviously creates concerns for public safety, and our department has been working with various organizations and communities to maintain a high level of safety. The fact that more bears are seen by locals always creates friction between scientific knowledge and southern biologists on the one hand, and traditional knowledge and biologists that live – like the Inuit – in the Arctic year-round among bears. One side claims the bears come onshore because there is no ice, others insist that there are more bears. I think the climate change proponents and “doomsday prophets” jump easily to the conclusion that climate change is responsible for this, and view the world at times too simplistically. In Nunavut, we look at it more from a holistic approach, and are more realistic: we know that there are constant changes in sea ice distribution during break-up, that there are more bears than there have ever been, and that at times there are more or less bears coming towards settlements. We are monitoring this situation closely to better understand the dynamics, and the condition of bears that are encountered. We should also not forget that there are more cabins on the land than 30 years ago, that the Inuit population (and settlements) has increased drastically from historic levels, that there are more attractants, and that people travel farther than they used to. So chances of encountering bears are also somewhat higher. Of course there is concern for public safety when bears come close to settlements, but our conservation officers and community members work diligently side by side to deter as many bears as possible, and as many times as is required to protect bears from people and vice versa. What kind of effects might this trend have on the polar bears, on terrestrial ecosystems, and people? Polar bears evolved as carnivorous mammals that feed primarily on seals. Where sea ice disappears seasonally polar bears are forced on land where they have to live off their stored fat reserves. Obviously, polar bears also vary in their ability to hunt, and to pack on fat. Bears that come off the sea ice in various conditions will also vary in their response – bears that are fatter could sustain a greater period on land as compared to bears that are skinnier. If bears come off the ice in poorer condition, then their energy reserves will not be sufficient to maintain their energy needs while on land. Some bears will be opportunistic feeders where they seek any sort of food, either natural (seals, fish, other carcasses), or human waste products. Others may starve to death. If they are females that are in poorer condition, reproduction is questionable because females need a certain amount of body mass to go through the denning and pregnancy phase, parturition, lactation, and movement back to the sea ice several months later. Since litter size, cub weight and cub survival are positively correlated with the mother’s body mass, poorer body condition could cause reduced litter sizes and cub survival. Changes in sea ice could also affect the spatial and temporal distribution of polar bears. For example, during aerial surveys in western Hudson Bay it was noted that there are more bears in the south-east corner of Manitoba, and that such a trend has been occurring for some time. Perhaps this is linked to changes in sea ice melting and distribution during break up. Bears that are usually denning on sea ice may be forced to den on land, or forced to travel longer distances to reach suitable sea ice. Few jurisdictions are fortunate enough to collect long-term data on their polar bear populations. To examine some of these effects as outlined above, long-term data are required. I think that all jurisdictions in Canada are doing their best to collect data on their polar bear populations and ecological/human dimensions in order to learn more about cause and effect relationships. Marcus Dyck is a polar bear biologist working for the Government of Nunavut who resides in the Canadian Arctic community of Igloolik, Nunavut.